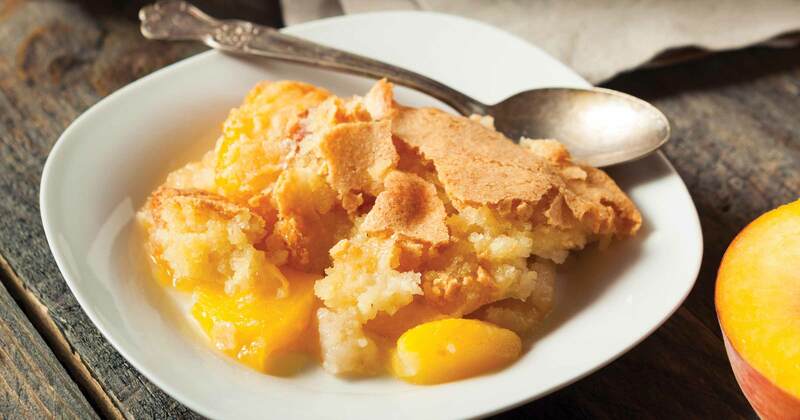 An out of the ordinary peach cobbler. Preheat oven to 400°. Grease an 8×8-inch or a comparable sized baking dish. Set aside. In a large bowl, whisk together the flour, 1/2 cup of sugar, baking powder, salt, and cinnamon. Stir in the milk just until combined. Spread into the bottom of prepared pan and place on a rimmed baking sheet. In a large saucepan, combine the water, brown sugar, 1/2 cup of sugar, and butter. Bring to a boil, stirring until the sugars are dissolved. Pour the syrup over the peaches. Bake for 40-50 minutes or until filling is bubbly.